SW19 sister to the well-known San Lorenzo in Beauchamp Place, this is the favourite haunt of tennis stars and locals alike. Modern, elegant and relaxed, it offers a fresh, innovative Italian cuisine drawing on the family’s traditional Tuscan and Piedmontese roots with a fine selection of new generation Italian wines. There is also a beautiful sheltered courtyard for al fresco eating during summer. Open every day 12.30-3pm and 7-11pm. All major credit cards accepted. 12.5% optional service charge. 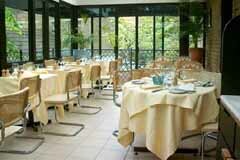 Fresh, innovative Italian cuisine with Tuscan and Piedmontese specialities.